Specificity of Pag lace is that it has its roots in Mycenae, and that is still present in the town of Pag a long time because the first record of lace dates from the 15th century when it was mentioned in Benedictine convent, also a distinct feature of Pag lace is that before there were no templates or blueprints to create them only in the manner of their sample, and passed from generation to generation, from mother to daughter through word of mouth and practical work. For the first time the lace had been formally presented at the exhibition in 1880. In the period since 1906. to 1943. the Pag's lace is shown in numerous exhibitions around the world, in London, New York, Budapest, Belgrade, Vienna, Milan, Prague, and at the World Exhibition in Paris in 1937. she won a gold medallion as an extremely valuable handcraft. Empress Maria Theresa at the Viennese court had kept Pag lace worker, which sewed lace for the court. Pag lace is a type of lace that is sown in the Croatian island of Pag (Island Pag), which is characterized by exceptional beauty samples, quality and method of making these centuries-old tradition of craftsmanship. In recent history in 1906. the mayor Frane Budak had founded Lace School of Pag lace in which the first teacher was Nina Rakamaric who had pedagogical training in Vienna. Frane Budak was also singled out the lace of other utilitarian objects such as curtains, towels, blankets, sheets and others and collected and made ​​about fifty original draft by which today lace is made. Lace School has worked continuously until 1945. year, then worked with smaller and larger interruptions to 1994. The continuous re-started work in the high school Bartul Kasic. With a lace making school in the preservation of tradition of Pag, lace plays a distinct role and the Association of Pag lace "Frane Budak" from Pag with a quantitative significant lace making. Pag lace is an original croatian product, and over the years has shown its value and later became the cultural heritage of Croatia, intangible heritage and to express souvenir of the island as well as Croatia and is one of the most authentic Croatian souvenirs suitable as a personal gift and keepsake. This "white gold" as you call it increasingly becomes the object of which is distinguished by its artistic value and appearance and it is not uncommon to see framed on the wall like a painting. 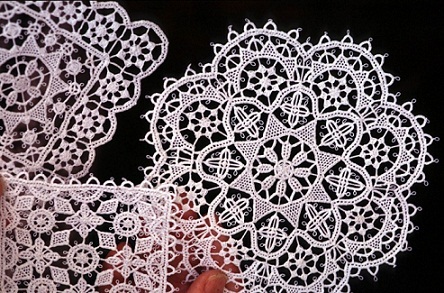 In the city of Zadar it has an open gallery with examples of Pag lace, lace old more than one hundred years. There are many types and forms of lace and this is one way of making: needle on the solid surface when the primary or extension pattern from the center outward like a spider web, which is characterized by exceptional strength, when the lace is used or the end of extreme thinness and strength that give specific transparent lace and rugged good looks, this is a way of making lace the source, Pag lace differs from other types of lace by strength and its thin making. Pag lace can be obtained from embroiderers who during the summer sit in front of their house. Pag lace smaller size can be a very nice touch to the festive clothes.